The move is the latest win for sagebrush rebels, anti-government extremists. 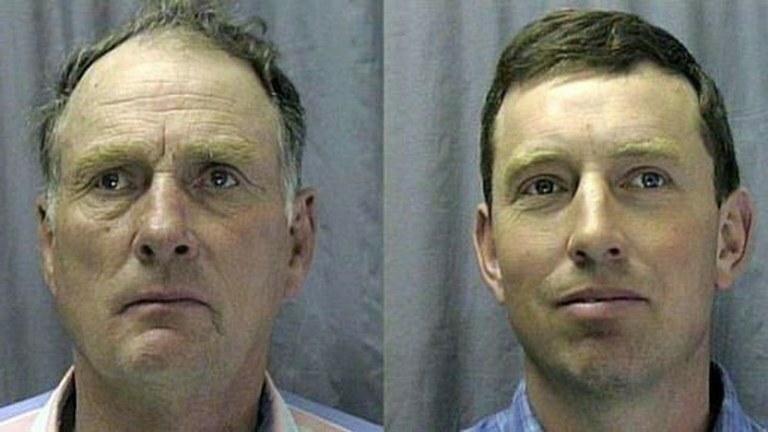 On Tuesday, President Donald Trump signed full pardons for Oregon ranchers Steven and Dwight Hammond, whose imprisonment triggered the occupation of Malheur National Wildlife Refuge in January 2016. The pardon follows a plea for clemency from Republican Congressman Greg Walden of Oregon, on June 26. Environmental groups and supporters of the refuge had a different take on the pardon. “We regret the message sent by the president when pardoning the Hammonds, which bolsters those intent on destroying federal property and endangering federal employees,” said Geoffrey Haskett, the president of the National Wildlife Refuge Association. Dwight and Steven Hammond, originally arrested in August 1994. The father-and-son duo were imprisoned for arson after setting a series of fires on private land that moved on to public land. While Walden has claimed that the Hammonds were simply using the fires as a range management tool, witnesses in the federal case against the Hammonds testified that one of the multiple fires were set to cover up evidence of illegal deer poaching on Bureau of Land Management land. Federal agencies incurred hundreds of thousands of dollars in expenses fighting the fires. The Hammonds have a history of clashes with federal land managers in rural eastern Oregon. Malheur refuge employees have alleged that they have received death threats from Dwight Hammond dating back to 1986. In 2012, District Court Judge Michael Hogan sentenced Dwight Hammond to three months in prison and Steve Hammond to a year and a day. After an appeal by the United States Attorney’s Office, the 9th Circuit Court of Appeals reviewed the case in 2015 and upheld the mandatory minimum sentences of five years. The imprisonment of the Hammonds in late 2015 was a flash point for the anti-government militia movement known as the Sagebrush Rebellion. After rallying in support of the Hammonds in Burns, Oregon, on January 2, 2016, brothers Ryan and Ammon Bundy, whose father Cliven Bundy is a prominent Sagebrush rebel, led supporters to take a “hard stand” and the heavily armed group occupied the Malheur National Wildlife Refuge. On January 26, 2016, LaVoy Finicum, a leader of the group, was shot dead by state troopers. In total, the occupiers’ stand lasted 41 days. The occupation did not have the full support of the Hammonds and divided the community of Burns. A support rally for the Hammonds in Burns, Oregon, in January 2016. Among the organizers on a truck bed that served as a makeshift stage were Brandon Curtiss, president of the Idaho Three Percent, Brooke Agresta, a zone leader for the Idaho Three Percent, and Jeff Roberts, with the Oregon Three Percent. Bobbe Helmerick, a retired air force veteran, was among protesters in Burns, Oregon, on Saturday, Jan. 2. Brandon Curtiss, of the Idaho Three Percent, hugs Dwight Hammond while Brooke Agresta of the Three Percent hugs Hammond’s wife, Susie. Dwight was supposed to report to Terminal Island, a low-security prison in California, on Jan. 4. BJ Soper, with the Central Oregon Constitutional Guard, stands with other protestors outside the Hammond home protesting Dwight’s upcoming imprisonment for burning hundreds of acres of public land. Militia and constitutional group leaders explain the plan to occupy the Malheur National Wildlife Refuge, 30 miles south of Burns, Oregon. Many in the crowd at the town hall meeting at the Burns fairgrounds said they worried the occupation group would make a bad name for the rest of the protesters. Rosella Talbot drapes an American flag over the sign for the Malheur National Wildlife Refuge Visitor Center. She brought supplies to the refuge headquarters, where militia had occupied U.S. Fish and Wildlife Service buildings. Two men standing guard at the entrance to the Malheur National Wildlife Refuge, while lookouts occupy a nearby fire tower. At least some men standing guard were visibly armed. “Patriots” gathered around a fire to keep warm the night of Jan. 2, as they occupied the headquarters of the Malheur National Wildlife Refuge. Ryan Bundy, at the Malheur National Wildlife Refuge. From left, Mel Bundy, Ryan Bundy and LaVoy Finicum stand amid of buildings that make up the headquarters and visitor center of the Malheur National Wildlife Refuge. Jason Patrick and Ryan Bundy walk up the road away from Malheur National Wildlife Refuge buildings, while two people climb the ladders in the fire tower where they will keep watch. Ken Medenbach, of Oregon, at the Malheur National Wildlife Refuge. “Gladiator,” who would not disclose his full name because he says he is “terrified” of the federal government, at the Malheur National Wildlife Refuge. Arizona rancher LaVoy Finicum at the Malheur National Wildlife Refuge in 2016. Finicum was killed in a confrontation with FBI agents during the occupation. Corey “Infidel 74,” of Nevada, at the Malheur National Wildlife Refuge. Clemency for the Hammonds is the latest in a string of wins for the Sagebrush Rebellion and the Bundy family. While figures of lesser stature in the movement have pleaded guilty to crimes related to the occupation in Oregon and the 2013 Bunkerville standoff in Nevada, the Bundys have thus far evaded any legal repercussions for their actions. Supporters of public land and federal agency employees were frustrated by the president’s move. Note: This article has been updated to correct an error involving the details around LaVoy Finicum’s death; he was shot by state troopers, not federal agents. We regret the error. The Malheur Refuge trials are over, but the movement that led to them isn’t.